The Fifth and Fourteenth Amendments to the Constitution include references to due process any time a person is in jeopardy of life and property. While the Amendments themselves do not specifically define what due process is, the Constitution itself provides elements of due process as have subsequent court decisions through the years. For example, the right to know what one is charged with in all criminal matters is in the Bill of Rights, as are the rights to a public trial and the right to cross-examine witnesses who testify against you. Any legal proceeding in the United States that fails to uphold these protections is not living up to the protections we claim to value so highly. A former U.S. Senator is currently fighting for his freedom, as is a former Hall of Fame caliber baseball player. All over America, people high and low are depending on due process to level the playing field, to diminish the power of Goliath, and to stand a chance when forces that want to destroy them are at play. In some cases the guilty will go free; in others the innocent will be punished unjustly. Regardless of the particulars, every American should take a solemn oath to protect and defend the tents of due process, just like the oath sworn by the men who signed the Declaration of Independence. What do you think? Is due process something most Americans understand? Can you identify how various elements of due process have been important in your life? How important is due process to the American creed? As for me, I pledge my life, my Fortunes and my sacred Honor. Some political observers think President Obama’s proposal to consolidate six federal government agencies is a political move. What do you think? The “occupy” movement of 2011 will go down as a lesson on the limits of the First Amendment and free speech rights for groups and individuals that have little more than something to say. The real free speech battle on the horizon is the looming explosion in campaign spending that will dwarf all previous records set in that regard. On the heels of the Citizens United decision by the Supreme Court, corporations—newly bestowed with the rights of personhood—and by extension, unions will stage movements that only the too big to fail can dream of. Where the “occupy” movement took over public spaces, corporate and union money will occupy both public and private space with little regard for the “time, place, and manner” restrictions that have limited activists around the country. Generally speaking, government can restrict free speech by using any number of time, place, and manner justifications. After all, people can’t do what they want whenever they want; or wherever they want; or however they want—that would be in invitation to anarchy. Free speech is like coloring; you have to stay within the lines. Forget the fact that the lines are only there in the free speech sense when there is an enforcement mechanism of some sort. Across the country it has been law enforcement agencies of one kind or another that have stepped in on the behalf of largely non-complaining others to bring the occupiers back into the fold. In a recent blog, Professor David Hollinger of Berkeley suggests that actions like “occupy Berkeley” are misguided representations of free speech and are distracting probably well –intentioned people from focusing on the larger issues with which the occupy movement should be concerned. He’s partly right. The evils of capitalism and Wall Street are hardly issues we can lay at the door step of local and state public institutions (like UC Berkeley). Unfortunately, it is local and state governments that are enforcing restrictions on free speech and assembly, with the likely consequence of having a chilling effect on some of our most cherished freedoms. History Professor, remember Shay’s Rebellion? The rebels seized government institutions that were involved in enforcing evictions and repossessions. Every campus police officer, every local sheriff or cop that arrests a protestor, is indirectly siding with the powers that be. Flower petals in rifle barrels. Peace. MPSL VLog: Commerce Appointment Tied to Trade? The Senate gives the President “advice and consent” by questioning and voting on appointed judges and Cabinet officials. How far can the Senate take this role in order to influence a president’s executive agenda? Professor Gaffaney explains. Merely Words on a Piece of Paper?! Does the government of the United States of America have the authority to execute its own citizens via assassination, without a crime actually being committed and without a trial? The 5th amendment does not think so. The 5th Amendment guarantees “no loss of life, liberty, or property without due process of law.” In other words, it is unconstitutional for the government to execute or incarcerate someone in the absence of an actual trial taking place. Nevertheless, Anwar al-Awlaki, an American citizen and, according to the U.S. federal government, a reported member and recruiter for al-Qaeda was assassinated under the direction of the CIA. I have no doubt that very few Americans will shed tears over the death of al-Awlaki, yet that does not change the fact that the U.S. government has no visible proof that al-Awlaki was anything more than a crazy militant ideologue. Declaring him a terrorist is simply not enough to warrant an execution without due process according to our own U.S. Constitution. In fact, republican presidential candidate, Ron Paul, is calling the assassination of Al-Awlaki’s by the U.S. government “an impeachable offense,” and I certainly agree. Ignoring the constitution is nothing new. The 1798 Alien and Sedition Acts made it illegal to criticize then-President John Adams. At the onset of the Civil War, Abraham Lincoln suspended the writ of habeas corpus, allowing protestors and rioters to be arrested and held without formal charges. During World War I, censorship of all communications moving in or out of the United States was authorized. During World War II the internment of Japanese-Americans was authorized by direct order of the president. Civil liberties were even restricted in the 1950s when Sen. Joseph McCarthy accused American citizens of Communist Party affiliation during the Cold War. Ignoring the constitution is always easy when the situation in question involves an extremely unpopular individual. Nonetheless, the U.S Constitution does not limit civil liberties to those that are deemed popular or worthy. 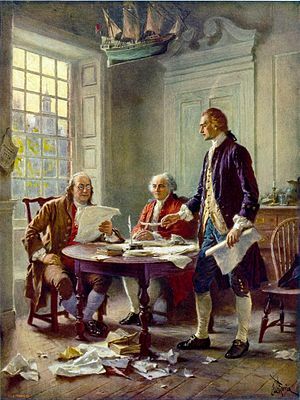 After all, is not the foundation of our greatness the U.S. Constitution and the liberties it guarantees? What does it say when we, as a society, merely treasure the principle of civil liberty in theory, but discarded it for the sake of convenience in practice? 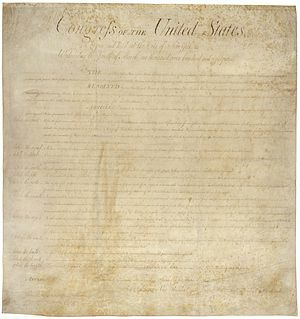 Are the civil liberties outlined in the U.S. Constitution merely words on a piece of paper? For an alternative view, check out K.T. McFarland’s blog post with Fox Form.